EOS®, the Entrepreneurial Operating System®, is a comprehensive business system, integrating a holistic business model with simple business tools and a proven process to align and synchronize all the elements of your business. What makes the Entrepreneurial Operating System® so effective is its simplicity, The model, proven process, and tools connect together intuitively, making EOS® easy for your leadership team to adopt and implement across your entire organization. 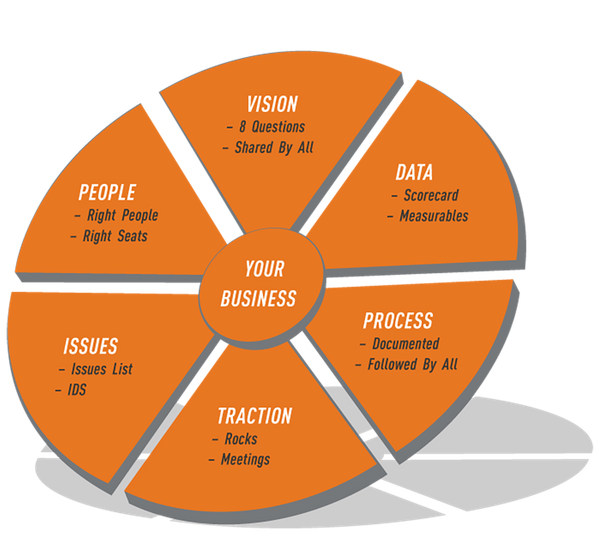 A visual illustration of the Six Key Components of any business that must be managed and strengthened to be a great business. Strengthening this component means getting everyone in the organization 100% on the same page with where you’re going and how you’re going to get there. Data means cutting through all the feelings, personalities, opinions and egos and boiling your organization down to a handful of objective numbers that give you an absolute pulse on where things are. This is the secret ingredient in your organization. 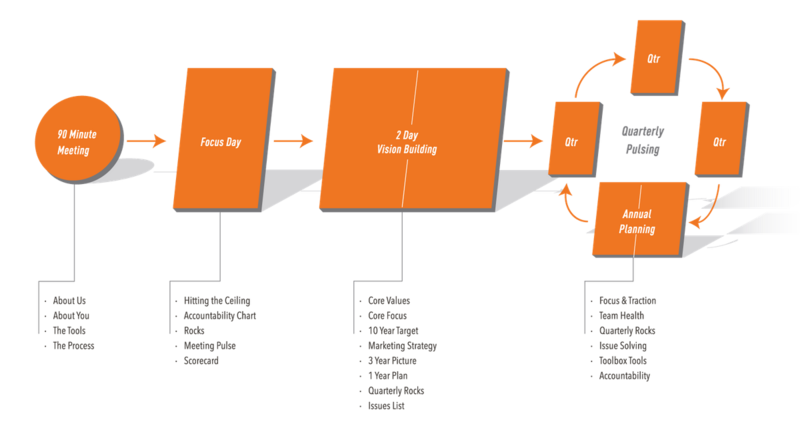 Process means “systemizing” your business by identifying and documenting the core processes that define your way to run your business. The glue of EOS, and our namesake, Traction means bringing discipline and accountability into the organization – becoming great at execution – taking the vision down to the ground and making it real. A proven way to incorporate each of the EOS® Tools in the right order to best strengthen each key component of your business. A day to give the leadership team tools to clarify who’s responsible for what, set priorities, resolve issues and track critical numbers. The team uses these tools over the next 30 days to experience real improvement. Another day with the leadership team to sharpen the Focus Day tools and begin using the Vision / Traction Organizer (V/TO) tool to clarify their vision: who they are, why they exist, what they do and where they are going. Another day with the leadership team to master the Focus Day tools and continue using the V/TO tool to complete their vision: clarifying their Marketing Strategy, 3-Year Picture, 1-Year Plan and priorities for the next 90 days. 2 Days with the leadership team each year to build team health, update their vision and plan for the next year. The result is a healthy leadership team focused on achieving every part of their vision. Get more of what you want out of your business today.